Many parents often wonder at what age should they first take their child to the dentist. Many are very surprised that pediatricians suggest that the first visit should be by the first birthday!! The American Academy of Pediatric Dentistry recommends that the first dental visit should be scheduled between the eruption of the first tooth, and the first birthday. Since national studies are showing that cavities are increasing in preschool children, it is important, now more than ever to start early preventive methods to avoid cavities. The developing teeth of infants are affected by pacifiers, teething, bottles, feeding methods, thumb sucking, gum cleansing, and also fluoride levels in the mouth. That first visit is important not only for the child but as an education session for parents to be more effective in promoting good dental health for their child. During the first dental visit, the child's teeth, jaw and gums are examined. Parents are shown proper positioning for child to do a thorough cleaning, and cleansing procedures are demonstrated. The dentist would look for any potential problems and the overall oral growth and development of the child will be checked and assessed. Also, the child's medical history will be reviewed and any preventative measures necessary will be discussed with parents. It is always a good idea to have dental visits scheduled before problems develop. That way, they can be kept short and that will help with the child becoming more relaxed in the dental environment. There are many people who believe that all dental procedures should be avoided during pregnancy. This is, in fact, a dental myth. Not only is it not true, but, it is recommended that during pregnancy, preventative dental and regular exams not be put off. It was very important for pregnant women to take care of their dental health during pregnancy. As a result of the hormonal changes taking place in a woman during this time, there is an increased risk for developing gum disease, which has been been known to affect the health of the developing baby. Ideally, it would be in a woman’s best interest to visit her dentist and have her gum tissue carefully examined, and have any oral health problems treated before pregnancy. However dental care during pregnancy is not forbidden. It is recommended that any necessary dental procedures during pregnancy be avoided during the first trimester and the second half of the third trimester. These periods are critical times in the development of the baby’s growth and development. However, routine dental care is encouraged during the second trimester. Dental exams should not be skipped during pregnancy. During this time, more than ever, it will be very important to ensure that your have good dental health, especially your gums. Dental work such as fillings and crowns should be treated to reduce the chance of infection. Elective dental procedures, like teeth whitening and other cosmetic procedures, should be postponed until after the pregnancy. Also, dental x-rays during pregnancy should be avoided, unless it is a dental emergency. Maintaining healthy oral health is absolutely necessary during pregnancy. Continuing a healthy oral regime during your pregnancy will help in reducing the risk for any dental problems. Dental veneers are used as a form of cosmetic dentistry to correct tooth enamel that is worn, discolored, chipped or cracked, or uneven tooth spacing. While creating beautiful, bright smiles, they also protect the surface of the already damaged teeth which may eliminate the need for further treatments. Veneers are made with different materials, including composite resin and porcelain. Porcelain veneers has been known to be used for the more serious cases of damaged teeth. these veneers has been proven to last up to 16-20 years. Porcelain veneers can be made as thin as a contact lens. They are more stain resistant than resin veneers, and are better able to and are better at mimicking the light properties of natural teeth. Porcelain veneers are also very safe for sensitive patients since there is no drilling and no removal of the tooth structure - there is no pain involved!! So, come on in and schedule a consultation with your Cincinnati Dentist, Dr. Craig Dowiatt, and let us show you how we can improve your smile with Porcelain veneers. Injuries to the mouth and face are the number-one sports trauma, and a dental injury is not only painful and costly; it's also permanent. Fortunately, many mouth injuries can be prevented by wearing an athletic mouth protector—also called a mouthguard. A mouthguard is a soft plastic appliance that fits over the teeth. When a properly designed mouthguard is worn, the lips, cheek, tongue and jaws are protected, as well as the teeth. The American Dental Association estimates that mouthguards prevent 200,000 injuries each year in high-school and college sports alone. Most people are aware that sports mouthguards are mandatory for participation in high-contact sports such as football, boxing and hockey. But what many people don't realize is that the majority of mouth injuries occur in children between the ages of 7 and 14, often while participating in commonplace activities like skateboarding, rollerblading or bike riding! Mouthguards should be worn during all activities where there is a risk of falling or head contact, either with another player or a piece of equipment. The Academy for Sports Dentistry has identified 35 activities and sports in which mouthguards should be worn to prevent orofacial injury, including baseball, soccer, basketball, martial arts, skiing, volleyball and gymnastics. Stock mouthguards are used right off the shelf. No modifications are made to enhance or customize the fit, so they offer very little, if any, protection. They also tend to feel loose, bulky and uncomfortable, and interfere with breathing and speaking, so it's likely they'll just be left in the gym bag. Boil-and-bite mouthguards fit somewhat better, because after they are purchased, their fit is enhanced somewhat by softening them in boiling water, then shaping them around teeth and allowing them to harden. However, this type of mouthguard also hampers speech and breathing, because the fit is not optimal. Furthermore, they aren't thick enough to provide adequate protection, and they become brittle after awhile so they need to be replaced relatively frequently. Custom mouthguards are created specifically for you by professional technicians, using a material that is resilient, odorless and tasteless. To fabricate a custom-made mouthguard, on the first appointment, impressions of your teeth are made. From these impressions, models of your teeth are created. The mouthguard is fabricated on these models to ensure that the fit is precise. Then, on your next appointment, your mouthguard is tried in and adjusted as necessary to make sure protection and comfort are optimized. While any mouthguard is better than none at all, a custom mouthguard is far more comfortable, so it's less likely to be left lying in the locker or the gym bag. They are also much more effective in preventing injuries, since they conform precisely to an individual's teeth. A custom mouthguard costs a bit more than off-the-shelf varieties, but their precise fit, comfort and excellent quality make them well worth the additional cost. 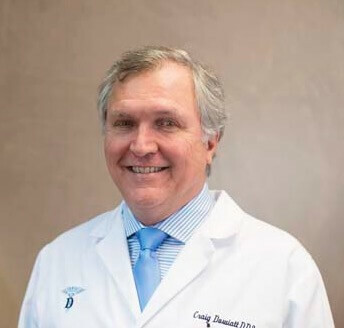 Dr. Craig Dowiatt attended Xavier University for his undergraduate degree ( Bachelor of Science), and The Ohio State University for his graduate degree, Doctor of Dental Surgery- D.D.S. Dr. Dowiatt practices in a state of the art dental facility with digital technology and modern equipment. He has also developed a reputation in the community for his integrity and level of personal care for his patients. " It has been a privilege and an honor to have treated so many Individuals and families over the past 30 years. I have been blessed with these wonderful relationships." In order to provide exceptional care, Dr. Dowiatt is committed to continuing dental education. He believes in giving his patients the oral health and great smiles they deserve, and looks forward to many more years to come.